If you are an egg fan and haven’t yet tried making a frittata, I highly recommend you do! Not only are frittatas easy and quite versatile — allowing for the incorporation of a wide variety of vegetables, cheeses, herbs and protein — they are economical and so very satisfying. I think this savory egg dish is almost foolproof. By following the simple instructions, it is hard to have a flop! 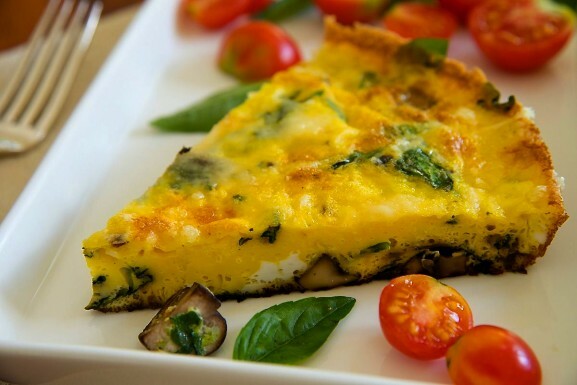 Moreover, one large frittata eliminates the need to make several smaller omelets–some inevitably getting cold. Leftovers are always a treat and can be served warm or room temperature. Fontina is a mild-tasting cheese that pairs nicely with mushrooms. Feel free to substitute Parmesan or, for a bigger flavor punch, feta cheese. Although I opted for a vegetarian version this time, I often sauté two ounces of diced pancetta or prosciutto until lightly crisp for its smoky flavor boost. Mix eggs with milk, salt and pepper in a medium bowl. Heat one tablespoon olive oil over medium-high heat in a 10-inch cast iron skillet or other oven-safe skillet. Sauté the onion until is begins to soften, 2-3 minutes. Add the mushrooms and sauté, stirring frequently, until golden brown and caramelized, about 8 minutes more. Cooking the mushrooms really well brings out their best flavor. Add the spinach and cook until completely wilted, another 1-2 minutes. Add another tablespoon of olive oil if the skillet become dry at any point. Reduce the heat to medium-low and pour in the egg mixture. Cook, stirring gently, until the eggs begin to set but do not begin to scramble. At this point, gently stir in 1/2 cup of Fontina and cook for 2-3 minutes more, without stirring, until eggs begin to set around the edges. Transfer the pan to the oven and bake until the eggs are just set in the middle, 4-5 minutes. Remove from oven and switch to broil setting. Sprinkle the remaining 1/4 cup cheese over the top and broil for 1-2 minutes, watching very closely, or until top is golden brown. I will have to try this! It sounds yummy and would be a perfect lunch for me. I hope you enjoy it, Beth! Are there enough words to express how good this frittata is? No. No, there are not! Glad it was a success, Caroline!